Activities for the region are starting up with two events this month and more being planned. Check the region site often as new events are being added regularly as committee chairs firm up plans for interesting activities that bring us together. In this issue you'll find a report submitted by region member Paul Roller, who attended the Detroit Auto Show along with region member Bob Flemming. Paul took the photo at right of the Cayman R at the show. Feb. 3 - Board meeting. Members are always invited to sit in on board meetings. The February board meeting is at Brew City Grill in Mequon. (10250 N Cedarburg Rd., Mequon, WI 53092. Brew City is on Hwy 57 between County Line Road and Donges Bay Road). The board hopes to find other locations in the metro area for board meetings to make the meetings more geographically accessible to members. If you have an idea for a meeting location, please contact Region President Rick Zinda. Feb. 5 - Carrera Chili. RSVP deadline was extended to Wed., Feb. 2. Read the recap of this event next month. We will be crowning some new supreme chefs at this event that features lots of casual conversation and sampling of many different chili entries in our friendly competition. Carrera Chili alternates with Turbo Spaghetti and is our region's long-standing mid-winter casual get together. Feb. 12 - Visit the Pace Toy Barn. You must RSVP by Feb. 7 if you plan to attend. Registration is limited due to the number of people that we can squeeze into the garage. This will be a casual event and a great way to spend a Saturday morning. Details here, including RSVP info. March 5 - Social committee planning session. If you have some ideas for social events -- dinners, short drives to a great restaurant, car shows, picnics -- whatever, join the committee and bring your ideas. Spouses of members are ideal prospective members of the committee. Details here. The Autocross committee has two dates at Miller Park (Yount/Dodgers lot) and one tentatively planned for the Wisconsin State Fair grounds. Driver education -- the chance to drive your car on a track in a controlled environment -- is gearing up for the season as well. Information about DE and the dates can be found on this page. Fox Valley region to tour waterfalls in the U.P. The Fox Valley Region is returning to the U.P. for a day of scenic driving with many stops at spectacular waterfalls, one of the UP's natural treasures. Milwaukee Region members are invited to participate. Here are the details. Steinlifters always invites new members to provide information about themselves and their Porsche. Thanks to these members who responded to the request to participate. Any member can submit information for this column. Contact the newsletter editor: beverly.jurkowski@sbcglobal.net. Mike Bolton joined the region in December. His story starts with how he found his way to PCA and our region. “Let me start by saying that I also have a 2002 Mazda Miata, which I hope to sell this spring. Two years ago I took a position at Cogmatic where we make large gears and sprockets for companies from Caterpillar to Rexnord. My boss, Bill Wright, who is an avid car guy and PCA member (he has a 2005 911), invited me to join in some of the DE and Solo events. I have had a great time for the last couple of years, met some very nice people in the PCA and wanted to join. “That, of course requires a Porsche.” In the last quarter of 2010 Mike purchased his first Porsche, a 2004 Boxster S. It is Seal Gray with Black interior and has about 67K miles on it. “I had been looking for several months and saw this one at CarMax. They brought it up to Milwaukee from North Carolina.” The car had been a Porsche lease car and then sold as a Certified Used Porsche. He is the third owner. “I have had Dean Fabson go over the car and fix a few minor things, but it runs great and I can't wait for spring. Al Wagner tells me that the "winter will seem interminable,” Mike said. “He is right, although I have had it out on cold but dry road days. I am interested in DE events and autocrossing so I'll be out there this year enjoying them again, but this time in a Porsche Boxster. “So far my best skill at DE events has been "point to pass,” but hopefully with a little more power I'll be able to improve on many other skills,” Mike said..
A special thanks to region members Bill Wright for introducing Mike to PCA and to Al Wagner for affirming his decision to join the ranks of Porsche owners and region members. Brett Stabelfeldt also joined the region recently. He has a 1984 911 Targa with black exterior and interior. The Targa has 92,000 miles on it and Brett is the third owner. “I bought it last winter from a customer of mine who brought it in to the shop I work at. Brett is an auto mechanic in Wauwatosa. It is his first Porsche. He learned about PCA from a friend whose dad was in the club. Brett is interested in track events and any opportunities to drive with the club and meet other members. Welcome Brett. We look forward to seeing you and that black Targa at Road America and Blackhawk this year. While the overall sports car sector continued to be challenging throughout 2010, Porsche maintained its relative market share strength. Porsche’s Boxster sales in December were 137, compared to 138 in 2009. For the year, Boxster sales were 2,177, up 14 percent from 1,909 a year earlier. The company’s Cayman model recorded December sales of 112 versus last year’s mark of 208. For the year, Cayman sales were 1,322 compared to 1,966 a year prior. 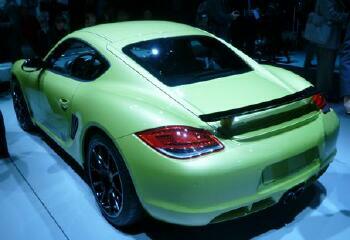 As for Porsche’s iconic 911 sports car, sales in December were 509 versus 544 during the same period in 2009. For 2010 overall 911 sales were 5,735 compared to 6,839 in 2009. This was my first trip to the Detroit show and it was a good year to do it. I was accompanied by Bob Flemming, another PCA Member. First, the domestic car industry (especially GM & Chrysler) is recovering from the brink of oblivion so there was an upbeat atmosphere. Car sales in 2010 were up substantially from 2009 for almost every major manufacturer and there were about two dozen new models introduced. The old days of "concept" cars appear to be over since new current models were rolled out by just about everyone there. 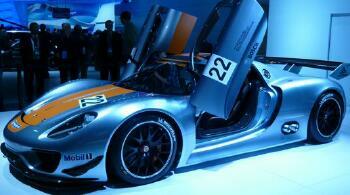 Porsche was back for the first time since 2007 and the only "major" not there was Nissan. Read the rest of Paul's report. The RSR grabbed some headlines. Read on. Classifieds...Check the latest classifieds, the most frequently visited page on our site.